The title comes from Mises's description of the reality of central planning and socialism,. 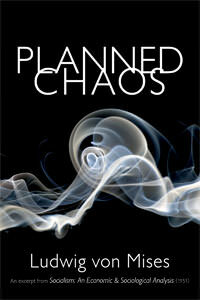 This new edition (completely reset) of Planned Chaos features a new introduction by Chris Westley of Jacksonville State University. The introduction brings this classic up to date - not that it has ever fallen out of date or ever will. The title comes from Mises's description of the reality of central planning and socialism, whether of the national variety (Nazism) or the international variety (communism). Rather than create an orderly society, the attempt to central plan has precisely the opposite effect. By short-circuiting the price mechanism and forcing people into economic lives contrary to their own chosing, central planning destroys the capital base and creates economic randomness that eventually ends in killing prosperity. This important work was written decades after Mises's original essay on economic calculation and includes the broadest and boldest attack on all forms of state control. from Pacific Grove Buyer Beware! This essay is included in Mises' Socialism. So if you own the book you already have this essay. It is certainly published as the epilogue to Socialism and printed there. It has traditionally been kept in print as a separate work, and yet went out of print a few years back. It is strong enough to justify a separate work. from Tamarac Good work, but do we really need it? Its my understanding that this work, first published in 1947 by FEE, was included as the epilogue to the 1951 edition of "Socialism" published by Yale University Press (and the basis for the editions from Liberty Fund and LvMI). So is it really necessary to keep this work in print? Also, people should be aware of this before they purchase it, thinking they are getting a work not available elsewhere. Must reading for any economist. I have the original 1947 hardback edition. Great book, and a very well organized volume. A must for any historians. Must reading for any economist. Very well written and tight structure/expansion of this point as discussed in Mises' Omnipotent Government. Good reading after Boris Brutzkus' Economic Planning in Soviet Russia. Good reading before Victor Suvorov's (Vladimir Rezun's) Icebreaker (or the newer 2008 The Chief Culprit: Stalin's Grand Design to Start World War II).